I mentioned in the previous post that I was considering doing some modular Sonobe origami in an upcoming workshop for middle school students. Wondering if this is a good idea, and thinking that I had better have some backup plans, I decided to make a list of origami models that I have used in school workshops in the past. These simple models are nice for the very young and for beginners. Start with a triangle made from cutting standard origami paper along a diagonal. A bit of playing around with the triangles should be enough for you to figure out how to fold examples like the ones above, and maybe even to come up with a few of your own. 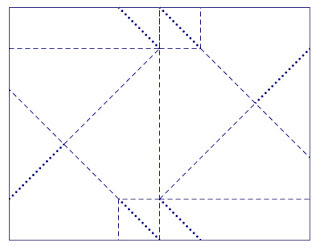 The instructions for the sailboat are on the OrigamiUSA diagrams page. This is a very nice toy model from OrigamiUSA. See this post for some notes on it. Whenever I have used this with younger kids, I have always brought some pre-folded ones with me for them to play with and draw on. A traditional model using a square origami paper, the instructions are also available from OrigamiUSA. It makes a nice pocket to put your frog into. See this post for more on this model. The origami t-shirt is a model that I use to start off workshops for older students - for younger children I usually bring some paper that has had the initial folds completed, so they can get to the finished product in a few folds - this motivates them to go back and do the whole model themselves. You can find the many origami shirts online, the one I use is one by Gay Merrill Gross that appeared in the first issue of Creased magazine. Maybe its because we don't send letters much that this model does not grab everyone as overly exciting. I like it, and it is good to have some origami that you can do with standard letter paper (lots of these available in schools). See this post about the crease pattern. Also from the OrigamiUSA page. This is the first and only origami model that I learned as child and I enjoy sharing it with children. It's another model (like the frog and the cup) that you can play with, and like the envelope it can be made from standard letter paper. The diagram is available on OrigamiUSA. The boat becomes even more playful when it is used as "storigami" in the tale of The Captain's Shirt. Happily destroying your boat while reciting the tragic story teaches an essential lesson about the impermanence of the origami art form. I had success with this model in a workshop for grade 7 and 8 students. There is a very nice overview of it here, and the model was also featured in Creased magazine under the name "origami blowtop," but I have not found the issue. Its modules are the first few folds of the waterbomb, another popular model for beginners. The waterbomb base has also made its way into origami tessellations (see here). If I were to do a tessellation in a workshop, it would be the waterbomb. All of the lesson plans for Creased magazine's "Teachers' Corner" are available online here. The picture frame is presented here in lesson 2. The blinz base used to create the picture frame is know to many children as the preliminary folds for the fortune teller or cootie catcher - another origami toy that is always fun to make. I've not yet used this in a workshop, but have enjoyed showing people how to fold it. You can make these from those pesky magazine inserts, or maybe from bus transfers. The model comes from Robinson's book "The Origami Bible." I have a post about it here. 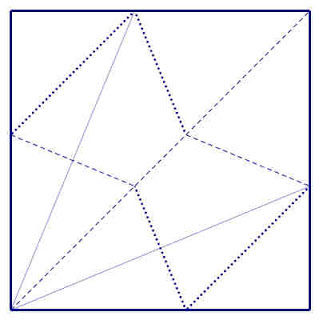 When considering how to present these models, and how to conduct workshops for young people, I've looked into the "origametria" approach described in this paper by Miri Golan and Paul Jackson. Perhaps because I have only done origami with students in workshop settings where the emphasis is not on the mathematical value (which I hope is intrinsic anyway), rather than as part of a regular classroom program, I have not followed the origametria principles very closely. However, their advice on using positive language and respecting the students's work and efforts are essential in any setting - any feeling students have about what they experience will outlive anything mathematical they happen to notice about the creases. 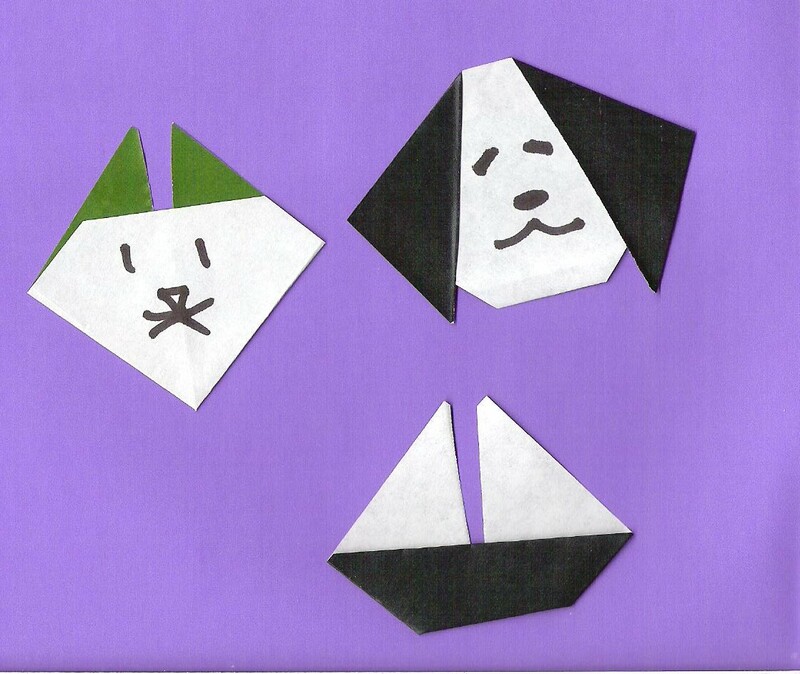 The resources on OrigamiUSA and Creased are great, but keep in mind that very few beginners are good at reading origami diagrams, and most children are put off by them. I like to have the instructions available for the students, but most of them learn the pieces by following along with you, and having you (and others) repeat the folds in front of them. A document camera is a plus, but you have to be willing to walk around and demonstrate the folds, and recruit helpers who are ahead of the others to assist you. Update: A handout used for the workshop, which did include a little modular origami, is here.